Bangalore: In the next four decades, millions of people will be forced to flee rising seas, floods, drought and other climate-induced effects, with the melting Himalayan glaciers particularly putting at risk the biggest irrigation system in the world, says a new report released on Wednesday in Bonn, Germany, at the ongoing United Nations climate change talks. /Content/Audios/2009-06-11/climatechange.flse4caca38-55d1-11de-9918-000b5dabf636.flvAlthough the precise number of migrants is not estimated, and may elude science for some time, the authors of the report, In Search of Shelter: Mapping the Effects of Climate Change on Human Migration and Displacement, say the breakdown of ecosystem-based activities such as subsistence herding, farming and fishing will be the dominant driver of forced migration. The authors claim the report is based on empirical evidence from a first-time, multi-continent survey of environmental change and migration which, through original maps, illustrates how and where the impact would be the most significant. The report doesn’t give any numbers of its own but cites other reports to claim that the number of global migrants, will range from 25-50 million by 2010 to almost 700 million by 2050. 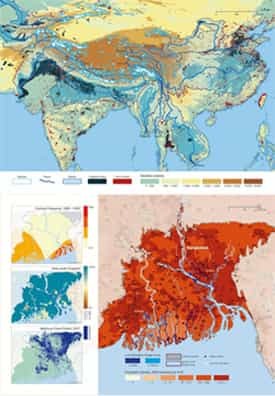 A report commissioned last year by the international activist group Greenpeace, titled Blue Alert: Climate Migrants in South Asia – Estimates and Solutions, has estimated that 50 million people in India and 75 million in Bangladesh will be rendered homeless by the turn of the century, with the bulk of Bangladeshis likely to seek shelter in India. “We categorize the poor as the ones who will suffer most, but richer societies will potentially lose as well," said geographer Alexander de Sherbinin at Columbia University’s Centre for International Earth Science Information Network in New York. Sherbinin has co-authored the report with researchers from the United Nations University and the humanitarian agency Care International. The International Earth Science Information Network is part of the Earth Institute headed by Jeffery D. Sachs, a known proponent of the significant impact of climate change. And to be sure, the report has been released in the course of the ongoing climate change talks deliberately—so as to generate the maximum impact. Still, some of its findings are alarming. But many South Asian cities lack the capacity to absorb significant migration streams. “There is potential for significant water saving efficiencies in irrigated areas of Asia, and, if properly implemented, this may forestall displacements of farmers," the authors say. Even as large coastal Indian cities are at an average sea level elevation of 2-10m, there’s been no systematic study to assess the extent of displacement, says Sudhir Chella Rajan, author of the Greenpeace report, and a professor in the department of humanities and social sciences at the Indian Institute of Technology, Chennai. “Such a study is also difficult to conduct as it is highly speculative at one level where assumptions have to be made about people’s behaviour." His study puts coastal India, particularly in West Bengal, Maharashtra, Tamil Nadu, Andhra Pradesh and Gujarat at the maximum risk of “out-migration". Even globally, the patterns of internal and international climate-induced migration and displacement are not fully understood, said Sherbinin. He suggests that future migration studies need to take into account environment drivers. Most conservative estimates put global warming to 2-3 degrees and that, says Rajan, will lead to 1m rise in the sea level. “Moreover, no one knows how the ice sheets in the Greenland and Antarctica will melt, but it is estimated the situation will be worse than the projection," he added. Still, the issue of migration is missing from India’s national action plan on climate change. There’s practically nothing on this, say Rajan and Himanshu Thakkar, convener of activist group South Asia Network on Dams, Rivers and People, in New Delhi. The report’s authors say the ongoing negotiations under the United Nations Framework Convention on Climate Change are focused on generating funds for adaptation in developing countries. Among other things, the participants should develop objective criteria for assessing people’s risk of displacement which could “guide priority assistance" in near future.